Produktinformationen "SHAPE Cage / Schutzkäfig für ATOMOS mit Handgriffen"
The best possible protection for your new ATOMOS FLAME monitor! SHAPE designed the new ATOMOS FLAME CAGE to offer the best protection on the market for the new ATOMOS FLAME monitors. This cage solution creats a solid, adjustable and safe frame for your monitor. The cage offers 1/4-20 threaded holes for many possibilities of attachment. It also provides maximal security for your monitor accessories with a fast locking system for SD cards and adjustable black knob for any size of HDMI connectors.The cage also provides extra space in the rear of the cage giving access to the SDI connectors. 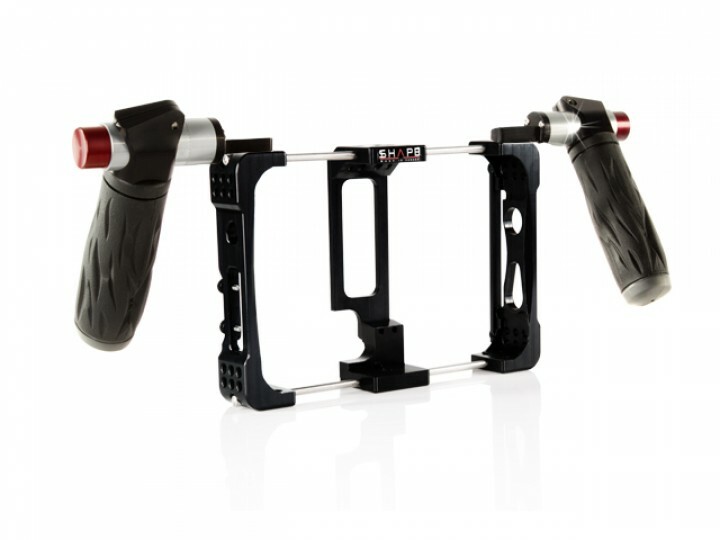 The ATOMOS FLAME cage can be used in multiple configurations. It can be combined with the SHAPE ICON series for great handheld solution. The cage was specifically designed to fit the 1/4-20 screws of the ICON bracket, ensuring maximum protection for optimal use. It was also designed with a spring system enabling to easily move the monitor in and out. Also included in this bundle, a pair of SHAPE handle with RED-PUSH BUTTON technology for fast and easy adjustment. Weiterführende Links zu "SHAPE Cage / Schutzkäfig für ATOMOS mit Handgriffen"